Alchemists believed that, by applying the universal solvent, any metal could be purified into gold, which was merely the perfect state of all metals. It was thought that even iron, if left to grow in the ground over time, would mature into gold; alchemical practice merely expedited this natural process. Alchemy involved techniques originally developed by craftspeople seeking to create objects of simulated gold, silver, gems, and pearls, as well as by dyers who attempted to counterfeit the rare and valuable Tyrian purple dye. Elements of alchemy also evolved from the demands of medical practice and pharmacology. Alchemy has a second, mystical component. The alchemist sought not only the universal solvent, but the universal panacea or elixir, a miraculous substance that, when applied to the body, had the power to heal or even provide immortality. The elixir allowed for the purification and perfection of the human body, just as the philosopher’s stone affected base metals. Alchemy, then, was a process by which the practitioner sought to uncover divine truths, hidden in nature behind the veil of physical forms. The uncovering of the occult, the perfection of metal, healing, and immortality were all made possible because of the connections that were believed to exist between the macrocosm, especially the cosmos beyond the moon, and the microcosm, including both the earth and the human body. The alchemist, if pure of spirit and intent, and connected to the greater forces of creation, could rearrange matter and manipulate it into the desired form. Two major challenges are presented in this discussion of alchemy. First, alchemy was not one thing, but many things at the same time; it was never solely theoretical, technical, or spiritual, but was almost always a combination of the three, each in varying amounts. The second challenge is the elusive nature of alchemical practice. Alchemists sought to keep their art a secret, and so wrote treatises in a cryptic style, filled with allusions and veiled secrets Alchemical works were often written under pseudonyms and attributed to gods, goddesses, and heroes of the alchemical world. The authors and dates of manuscripts are not easily discernable; lines of transmission are difficult, if not impossible, to identify. Just as the sources for a single manuscript are multifold, so are the various influences on alchemy as a whole. The roots of alchemical theory can be found in the philosophies of Milesians in the sixth and fifth centuries BCE. From their poleis on the coast of Iona, they pondered the nature of the cosmos. No longer satisfied with mythological explanations for natural phenomena, they developed their own epistemologies. Key to the development of alchemy was the belief in an ultimate substance from which all things are made. Thales believed that the underlying substance of creation was water. Anaximander postulated that a vast nothingness called the “apeiron,” from which emerged a seed, was the source of all creation. Other theories abounded: Anaximenes cast his lot for air, rarified and condensed; Heraclitus of Ephesus, for fire; and Leucippus of Miletus, for tiny particles called atoms. While these philosophers were not alchemists, their theories were essential to the development of alchemical theory. For if there is a single substance from which all matter is made, then copper is in essence the same as gold, with only a different physical appearance. In the fourth century BCE. Aristotle. like the Milesians. believed in a universal prima materia. Objects in nature were composed of ‘matter.” the underlying substance from which all things are made, and “form”; the qualities impressed upon the matter to create different objects. While the form of objects might change, the matter itself did not. Aristotle postulated that change in matter took place through the shifting balances of the four elements: earth, water, air, and fire. The foundation of the four elements were the four qualities: dry. wet, cold, and hot. The combination of cold and dry yielded earth, cold and wet yielded water, hot and wet yielded air, and hot and dry yielded fire. Aristotelian elemental theory is of the greatest importance for alchemical theory. Not only is all of creation made of the same substance, but the form of matter can be manipulated through processes of combination and dissolution. Belief in an ultimate substance and Aristotelian elemental theory contributed to the understanding of the physical nature of matter. Stoicism, which developed between the fourth and third centuries BCE, explored the spiritual dimension of matter. Stoics argued for the power of pneuma. or breath, in the creation of matter and the generation of all of its physical qualities. Heavenly pneuma descends to create matter, therefore, within matter is the indwelling nature of the divine. Future Gnostics, Hermeticists, and alchemists would seek to commune with the heavenly pneuma and. through divine revelation, understand the fundamental workings of the physical world. Stoicism introduced the link between the practitioner and the divine. For later alchemists, Stoicism was to provide the foundation for their belief that the state of the practitioner was elemental to the success of the experiment. Only the alchemist who was rightly guided and spiritually pure would be able to manipulate the elements of nature to create noble substances. The operations of metallic transformations seem to have become ritualised into an expression, primarily symbolic, of death and revivification. But this does not necessarily mean that the adepts of that time no longer concerned themselves at all with practical techniques. If one reads through the texts attributed to Zosimus, one can sec that he thinks the material body of gold is nothing, that the quality of ‘gold’ is independent of the metallic substance which supports this spiritual quality (spiritual because conferred by the action of volatile fugacious vapours), and that this higher spirit is ‘gold ‘, furthermore that when one possesses a material in which this ‘gold quality’ resides (just as one might possess the essential colouring principle of a dye) one thereby has in hand what was later called the philosophers’ stone, and can then ‘tint into gold’, in this way making ‘true gold ‘. It is interesting that there are certain actual definitions of gold in the Hellenistic Corpus, and they confirm all that has been said so far. Gold. It is pyrite, cadmia,d and sulphur. Gold. Fragments and pieces of metals and minerals yellowed and brought to perfection. Gold is what we call the white, the dry, the yellow, and (materials) tinged golden with an unfading dye. You will find five parts less one part, clearly because of the [sulphur] evaporating. Likewise in the process of reduction, and in smelting, at the end of its treatment, copper loses a third of its weight. Copper heated with sulphur and treated with an emulsion of soda and oil and shaken, after receiving this treatment many times, becomes a superior gold, without shadow…. Though Egypt is generally recognized as the mother country of the chemical and alchemical arts, her monuments and literature have left little of early records to explain them to us. It is through Greek and Roman sources mainly that some of these ideas have been transmitted to In, but the character of the sources is not often such as to enable us to discriminate between the matter derived from Egyptian science and thee confused interpretation or additions of the early Greek alchemists. At about 290 A.D. the Emperor Diocletian passed a decree compelling the destruction of all works upon alchemical arts and on gold and silver throughout the empire, so that it should not be possible for the makers of gold and silver to amass riches which might enable them to organize revolts against the empire. They were discovered at Thebes, and both formed part of a collection of Egyptian papyrus manuscripts written in Greek and collected in the early years of the nineteenth century by Johann d’Anastasy, vice consul of Sweden at Alexandria. The main part of this collection was sold in 1828 by the collector to the Netherlands government and was deposited in the University of Leyden. In 1885, C. Leemans completed the publication of a critical edition of the texts with Latin translation of a number of these manuscripts, and among these was one of the two works above-mentioned. It is known as the Papyrus X of Leyden. The following selections represent the practical or “exoteric” side of alchemical writing with its exclusive concern for the physical and technical processes required to produce an object or substance or to improve that which is “natural” by means of artifice. Thus the recipes illustrate the close connections between early chemistry and metallurgy, dyeing, jewelry making, writing techniques, and various other crafts. The style is clear, simple, and methodical, vastly different from the highly imagistic allegories of the Dialogue of Cleopatra and the Philosophers and the Visions of Zosimos of Panopolis. If one ignores the persistent uncertainties about substances, measures, and durations of processes, it might be said that here are reasonable examples of technical writing — overlooking, of course, the rather common emphasis on fraud and deception. Leyden Papyrus X and the Stockholm Papyrus, which bear the names of the cities in which they are deposited, are written in Greek — probably by the same writer — and date from the end of the third century AD. They are, in the words of Earle R. Caley, the translator, “by far the earliest original historical evidence that we have in our possession concerning the nature and the extent of ancient chemical knowledge” (1149). Leyden Papyrus X includes 111 recipes, often written in an “abbreviated, incomplete form such as workers, more or less familiar with the nature of the process, would use” (1150). In contrast to the metallurgical emphasis of the Leyden manuscript, the 154 recipes in the Stockholm Papyrus deal with a variety of other chemical arts, such as making dyes and imitations of precious stones. One has difficulty imagining any alchemical process as being successful. But equally, one has difficulty imagining any king, especially King Charles XII, and a British artillery general, being taken in by a charlatan, especially when the charlatan is on trial for his life, and when Charles XII had potential riches to gain. The Swedish royal courtesans and ministers would have literally hovered over General von Paykhull, scrutinizing his every move. Queen Christina of Sweden (1626-1689) A lifelong student of alchemy and the Hermetic arts, Christina abdicated in 1654 and travelled to Rome, where she renounced Protestantism and converted to the Roman Church. She spent the majority of her remaining years in Rome, where she, like Lady Anne Conway, presided over an active Hermetic circle. Her interest in alchemy is thought to have increased in later life, from 1667 onwards. Rosicrucian activity emerged from Charles II’s contacts with Queen Christina of Sweden, a student of the occult sciences. Michel Le Blon, her Amsterdam (Netherlands)-based art consultant, was rumored to be a Rosicrucian and author of a tract for the fraternity.° The queen was probably aware that Swedish Rosicrucian networks were currently functioning in the Baltic region. For, the Queen and her advisers, like other 17th century Italian alchemists, demonstrated a marked interest in pre-Paracelsian alchemy. The presence of the pseudo-Lullian works is typical of such a mind-set. On the other hand, Christina also collected works of the newer chemistry in the Paracelsian corpus, as well as Rosicrucian-influenced treatises. Akerman has noted that the Queen’s library included some two thousand manuscripts of a mystical character. Many of these were the most recent Hermetic texts including Trithemius’ Steganographia (MS Reg. Lat. 1344) and John Dee’s Maras Hieroglyphica (MS Reg. Lat. 1266). There were also older magical books such as parts of a Picairix (a medieval Arabic book of magic) and a Latin kabbalistic work, SeJer-ha-Raziel (MS Reg. Lat. 1300) which described angel magic. There were several thousand printed items including editions of Paracelsus and his followers such as Johannes Thurneysser. She recalls a similar emblem of a bee, cobweb and rose at the head of Robert Fludd’s treatise, Summum Bonum (Frankfurt 1629), and the words, “Da Rosa Mel Apibus”. Descartes as a Rosicrucian; it was written by Nicolaes Wassenar, said to be Jacob Wassenar’s father. This book predated Descartes’ move to the Netherlands by four years. Another individual with Rosicrucian associations was Cornelius van Hooghelande, a physician who was interested in alchemy. Descartes enjoyed a long and close friendship with him after moving to the United Provinces. As with the Wassenars, both van Hooghelande and his father were open in their adherence to Rosicrucian ideas. When Descartes went to Sweden in 1649 to serve at the court of Queen Christina — his last, and fatal, move — he gave his private papers to van Hooghelande for safekeeping. While the correspondence between Princess Elisabeth of Bohemia (1618-80) and Rene Descartes covers topics spanning the range of philosophical inquiry, still it was not written for the public. Early on in the correspondence, Elisabeth is quite insistent that their exchanges be kept private. In concluding her letter of 6 May 1643, she charges Descartes to refrain from making their exchange public,’ and her letter of 10 October 1646 demonstrates that they considered communicating in code. Yet later on, without Elisabeth’s permission, Descartes, through his envoy Pierre Chanut, sent Queen Christina of Sweden a copy of both sides of their exchange on the sovereign good. Decartes book “The Treatise on the Passions of the Soul” was written in 1645-1646; before its publication in 1649, it was read in manuscript and commented on by Descartes’ friends, among whom were Princess Elizabeth of the Palatinate and Queen Christina of Sweden. In October 1649 Descartes arrived at the court of Queen Christina in Stockholm, where he had to give daily lessons of philosophy to his royal pupil at five o’clock in the morning; within four months his health failed and he died. But it was an ill fate that took him to the wintry climate of Sweden, for there he became ill and died February 11, 1650. Philosophy. The 22-year-old Christina perversely made the 53-year- old Descartes rise at 5:00 am (commanded by her) to give her philosophy lessons. Descartes slowed his writing and instead communicated personally with small groups or individuals who sought his knowledge. One such individual was Queen Christina of Sweden, who in 1649 invited Descartes to be her philosopher-in-residence, and he accepted. Unfortunately, the queen insisted on being tutored at five o’clock (on her demands) each morning, and one day Descartes had to travel to the palace before sunrise during a severe Swedish winter. After only six months in Sweden, Descartes caught pneumonia and died on February 11, 1650. He was first buried in Sweden in a cemetery for distinguished foreigners, but there is more to this unfortunate story: Sixteen years later, his body was exhumed, as it had been decided by various friends and disciples that it would be more fitting for his bodily remains to rest in France; perhaps they did not respect as seriously as he might have wished, Descartes’s belief in the possibility of a disembodied spirit and the existence of mental processes in the absence of any brain. The French ambassador to Sweden took charge and first cut off Descartes’s right forefinger as a personal souvenir. It was then found that the special copper coffin provided for transporting the body was too short. So the neck was severed and skull removed to be shipped separately. The coffin returned safely to Paris and Descartes’s headless body was reburied with great pomp. The skull had a more sordid fate: It was stolen by an army cap, tain, passed from one Swedish collector to another, and took 150 years to reach Paris, where it was awkwardly shelved in the Academie des Sciences and has apparently remained there ever since. When Queen Christina of Sweden pleaded with him a few years later to come to her court, he refused. But the Queen was not put off easily. And now she wanted the most famous of them all—Descartes—to add to her collection. Enticed by promises and praise, Descartes finally relented —not without misgivings—to go to “the land of rocks and bears” for three months. In the fall of 1649 he set out for Sweden and on his arrival was received by the Queen “with such a distinction as was observed by the whole Court.” Then for six weeks Christina ignored him—supposedly so that he could leisurely “familiarize himself with the genius of the Country.” Although Descartes had planned to stay only three months, the Queen had other ideas. She appointed him to her Privy Council—obviously an action with long-range implications—and commended him to “compile a compleat body of all his Philosophy,” also a task that would keep him busy for more than a few months. Descartes accordingly “began to rummish and ransack his Trunk” of notes and writings, but his papers “were all in pieces scattered up and down,” and he never got to put them in order. Christina had great plans for her newest and most glittering catch. She planned to give him a house in the most southerly and warmest part of Sweden, present him with a title, and best of all, build an academy and appoint him director. Certainly, with all these inducements, it would be difficult for him to leave. After his initial six weeks of freedom, Descartes was summoned daily to instruct and converse with the Queen. Unfortunately, the sessions began at five in the morning and were held in a large, cold room—not too pleasant an arrangement for a man who was used to staying in bed until almost noon and who hated the cold. But Descartes was either too timid, too polite, or too awed by royalty to complain. With that splendid speech, he died. He was buried in Stockholm, where Queen Christina was still going ahead with her grandiose plans for the great philosopher—albeit somewhat altered. She wanted to build him a grand mauso-letun, but the French ambassador dissuaded her. Descartes body was later moved to Paris, where it rested for a while before being moved twice more. In this context, theTrinity is the expression of an ego-driven consciousness (a supercomputer), the evil Demiurge and Archon — a projection of artificial intelligence. The Lord Archon has entrapped humanity through deceit and parasitism in a simulated world of matter to prevent human beings from remembering that they are divine spirits whose real home is the Cosmic Mind or Gnostic Pleroma. The cosmos he creates is a simulation – virtual reality projection in the simulation of a higher dimensional pattern. The gnosis involves the revaltion of man´s true divine nature and evoilutionary origin resulting in his liberation (at death) from the enslaving material prison of body and world into the higher astral planes of spirit. In “Gnostic Symbols of the Self” Jung equates the godhead with the unconscious and differentiated matter with the ego or ego consciousness, but in his brief discussion of the Gnostic Hymn of the Pearl he reverses himself. Matter, here in its raw rather than differentiated state, now symbolises the unconscious and the godhead the ego or ego consciousness. Jung stresses that the Hymn obliges human beings to descend to the material world in order to realize their divine, immaterial nature. Clearly, the descent refers not, as in “Gnostic Symbols of the Self,” to the birth of the ego out of the unconscious but, on the contrary, to the re-entry of the ego into the unconscious for the purpose of raising it to consciousness. The birth of the ego described in “Gnostic Symbols of the Self” is now presupposed and constitutes the beginning rather than the end of the journey. Matter now not only already exists rather than emerges but also symbolizes the unconscious rather than the ego, which is now symbolized by the godhead. These new equations only reverse, not solve, the problems the original ones posed. First, the return of the newly independent ego to the unconscious should be for the purpose of raising it to consciousness, but in fact the descent of the savior is for the purpose of extricating the divine sparks ensnared in matter. Gnostics believed that God was perfect and pure, living in a realm of light, separated from matter. … In the process, bits of divinity were trapped inside the material universe. Christ was an aeon who inhabited the human Jesus in order to teach human beings to recognize and liberate the divine spark within them. Trapped in this world and, in particular, within the body, was the spark of divine light which had originated outside the universe but had fallen into this world and become imprisoned. This is analogous to the spiritual center or Self being kept from consciousness by an ego which refuses to recognize the possibility of an authority greater than itself. “The Heavenly Aphrodite” having “no part with Matter,” the body (these burning cheeks, this pulsing blood) becomes a “garment,” a “corpse,” a “grave,” a “prison,” a “chain,” a “burden” (because it keeps the spark of life from becoming a flame). It also becomes a dangerous “enemy,” the source of disorder, chaos, war, violence (because it disturbs the divine order). Finally a “veil,” a “shadow,” a “night” (because it obstructs our view of the Heavenly Aphrodite, our perspective on eternity). All evil is a ccretion” it is something alien to the inmost nature of the soul, which arises in the course of its embodied life. The Archons preventing the spark of light (the divine essence of humans) from returning to the pleroma. God, the tyrannical and presumptuous archons rule the cosmos like a vast prison, enslaving humankind and preventing at death the return to God of the “pneuma” or “spark” in the human soul, the slumbering portion of the divine substance. To this purpose all our body regions are permeated by nerve substance which represents the active spiritual principle. That this is so is due to the presence of a divine spark which slumbers in every human breast and which needs only a breath to fan it … “God lives in you; in movement, in brightness and in sound you may behold the eternal forward motion of the spirit. There is in the soul of every being created in the image of God, an instinctive craving after a higher life ; an upturning toward that which is spiritual ; an effort of the mind to grasp the invisible, and seek it as a permanent good. In the deep darkness of the night, a volcano burst forth, and on the city, in its slumbers, poured its torrents of fire and death. The sun is but a spark of fire, A transient meteor in the sky; The soul, immortal as its sire, Shall never die. Our soul is immortal. It derived its being from God. It is born never to die. You are a soul; a something which can think and feel independently of the body, and will exist when the body is dead. Immateriality was divine and wholly good. Matter was irredeemably evil. The cosmic predicament was that pieces, or sparks, of divinity had become trapped in matter. Human souls lay trapped in bodies. They saw the material world as the product of evil forces, though scattered fragments of the higher spiritual realm had tragically become enmeshed in this dark world. Trapped in matter and subordinate to the powers of destiny, human beings were slaves to powerful cosmic forces, or archons—”rulers”—a subjugation which could be overcome by liberating the inner spark of the divine within the individual believer. This was achieved by learning the mystical practices, spells, and words of power which would allow the initiate to ascend to the highest spiritual realms of light and truth. To the Greek way of thinking influenced by Plato, all tangible matter is detestable. This realm of substance we inhabit on earth is but a substandard shadow of the perfect realm of pure idea or thought. Humans, then, are divine sparks trapped within prisons of fleshy matter, and death is a liberation. Freed from its captivity in the realm of substance, the mind can fly to its true home in the realm of idea. Salvation comes by the soul’s escape from the body. Soul and body are essentially opposed. The soul is a spark of the divine trapped by the creator in matter. Self-conscious liberation of this spark unites it with the realm of God Consciousness. We yearn for an escape from the prison of history. We long for what Eliade called the Eternal Return, a mythical, timeless era outside of time, before history, or after it (there is really no difference). Linear, historical cultures are trapped in history in much the same way that each individual is trapped in the time frame of his or her life. Every life has a beginning and an end; we are pushed along, inexorably, by time from the moment we are born to the moment the plug is pulled and the sheet drawn up. We are spirit trapped in matter and must find our way out. The goal with liberate the light – is to free the trapped divine sparks from their encapsulation of matter. This tension between the divine light, the sparks of God, and the grossness of matter is what is causing the corruption of the world. How does one free the divine sparks? Because if we could free all the sparks, we would restore the original act of creation. The Gnostics thought that Evil was not so much a negative quality – an absence – as a positive one. They believed that the world that resulted from the emanations of God (which they called aeons) was a purely spiritual world, which they called the Pleroma. The material world – which included the human body – was the creation of a Demiurge, a rival of God. Some of the radiance from God, sparks of the divine, had become trapped in parts of this material world; in a human being the Soul was one of these sparks. If it were to be freed from the trap or prison of the material world and to rejoin the purely spiritual world, it needed a special and esoteric knowledge or gnosis – hence the word given to this philosophy. Nevertheless, the mysteries of alchemy continued to influence Goethe throughout his life: he gradually came to understand this craft to be an allegorical system, that it was studied by the ancients and medieval scholastics to contemplate the spiritual and physical aspects of the universe. As the years progressed. Goethe began to use alchemical imagery in his writings, encoding his works in an esoteric allegorical code perceptible only to the attentive initiate. As mentioned in previous chapters of our study, alchemy is generally perceived to be an ancient quest for the knowledge of how to turn base metals into gold and to procure the elixir of immortal life, marvels that could be accomplished with the discovery of the ‘philosopher’s stone’. These simplistic descriptions are misleading, for alchemy in its original context was more than the search for earthly wealth— it was an all-encompassing philosophy, a ‘Great Science of Knowledge’ that allow man to comprehend his world and the unseen realm of the Divine. Alchemical traditions first originated from the classic pagan and Gnostic ideologies of the creation of the universe. Aristotle taught that the cosmos was formed by a ‘Prime Mover’ who arranged the four elements into their respective order, all bound together with a mystical fifth element, the quintessence. Gnostic doctrines (2 to Pcentury AD) were derived from the gradual inclusion of Egyptian, Persian, Greek and other oriental precepts, thus a more complicated belief system in the duality of spirit and matter emerged. The ancient Gnostics acknowledged the existence of a great immortal spirit-entity or deity who is unreachable and incomprehensible. A series of lesser ‘gods’ generated and proceeded from this Being by ’emanation’. In certain Gnostic myths, the last of these lesser divinities was Sophia, or Wisdom, but she desired to attain full knowledge of the First Absolute Being, and with this illicit desire, she corrupted the process of emanation, begetting the evil spirit-entity called the demiurge. The world of corporal matter, including the human race, was then created by the demiurge. who reigned with legions of archons (rulers) in the planetary spheres. The physical world was often considered ‘evil’ and corrupt by the Gnostics for it was ruled by rebellious archons, while the upper sphere, remained the kingdom of the good entities. The uppermost sphere of Saturn was believed to form a boundary between the lower physical world and the higher spiritual realm. However, the Supreme Being did not desire the eternal destruction of the human race, and thus sent into the physical world divine ‘sparks’ fragmented from Itself that all became confined in matter: a form of the ‘quintessence’ or ‘divine spirit’ in Creation—an internal cosmic map leading man back to that union with the Supreme Deity. Thus, according to Gnostic ideas, humans were a combination of both worlds, a body and soul formed from physical matter, while simultaneously possessing a third spiritual element called the manna, or ‘divine spark’ that displayed the divine origins of man. Humans remained trapped in the physical world unless they received divine knowledge of their true nature through mysterious messages imparted to a chosen few, whose sacred duty it was to transmit this knowledge, or gnosis. to their brethren. However, knowledge of the physical universe and how it worked was also essential if mankind could hope to overcome this ‘trap’ of corporeal matter ruled by the evil archons, not only to obtain spiritual salvation, but also to attain a certain degree of peace and harmony while on earth. A considerable measure of Gnostic cosmology was adapted from the teachings of Heraclitus of Ephesus (540-475? BC), a Stoic philosopher who believed the physical realm also operated according to the laws of life and death. It was born in the element of fire, and progressed through the various elements until it would suffer ‘death’ by fire, but as it dies, it leaves a ‘seed’ from which the cosmos is reborn. To initiate this growth, a universal ‘male’ and ‘female’ element was required to form a cosmic union, i.e. the ‘divine’ with the ‘physical’, an idea that would be included into the craft of alchemy. Without one word of falsehood. That which is above is the same which is below. And that which is below is also that which is above. These are the miracles consummated in the One. And, how all things are derived from the One, through your mediation, Also, all that is created by the image of this One Thing through adaptation. The Sun is your father; your mother the Moon. The wind transports it into your belly, and the Earth nourishes it. It begets all the marvels of the Universe. Your power will be complete when you return to the Earth. Separate Earth from Fire, the subtle from the vulgar, Gently and with great ingenuity, Ascend from the Earth to the Heavens and return to the Earth. Combining the superior powers with the inferior. In this manner you will achieve the glory of the Universe, And all obscurity will flee from you. This is the power of all powers, For this goes beyond all subtle things, And penetrates all solid things. In this way the world was created. And in this way turns to new works. For I am the master of the three principles of Universal Wisdom. 1) Calcination. Process of burning the materials to white ash, considered a procedure of purification, symbolises the secret fire that destroys all corruption. Represented by the planet Saturn. 2) Dissolution: The ashes, usually calcinated plant material ‘sal sails’, is dissolved; part of the symbolic process of “dissolving” the corrupt body and “solidifying” the spirit, i.e. separating the “Garth” from “Fire” according to Hermes. Represented by the planet Jupiter. 3) Separation: The process of separating the ‘male’ and ‘female’ elements as they are not in harmony. Part of removing the “subtle from the vulgar”. Represented by the planet Mars. 4) Coniugation: The “marriage” of materials, for example the ‘male’ (Sun) element of sulphur combined with the ‘female’ (Moon) element of mercury, to produce the ‘child’= salt. This trinitarian process was used in gold alchemy. 5) Fermentation: Symbolises the putrefaction of death. Represented by the planet Venus. 6) Distillation: An invention of the alchemists to liberate volatile essences, the vertical spiral tubing represented purification of the spirit and soul as they ascend to heaven and return to earth. Represented by the planet Mercury. 7) Solidification: Solidifying the materials and collecting it in the alembic once distilled. “Dissolve and solidify”—the ‘Philosopher’s Stone’ is perfected. Jesus said, “You will know the truth, and the truth will set you free. Symbolically, alchemy represents our attempts to refine or improve ourselves Individually and collectively. Proverbs 15:24, The way of life is above to the wise, that he may depart from hell beneath. To complete His work he has sent his Messenger with the spirit or science of the truth. All you are doing, in truth, is getting your consciousness in harmony with your God consciousness! And mystical theology confirmed the vision of truth revealed by nature and alchemy: The true Knowledge is God. The truth is linked to your DNA light codes. In each one of you, your DNA is coded to respond to truth. In that way, the truth will set you free. The DNA within your cells contains a message to yourself; it is the blueprint, the code to help you remember your greatness. When we agreed to this experience, we agreed to put a safety net in place. This is the peace you discover when you find the truth held within your soul. It is the peace that indicates you have safely arrived. It is my peace within your being. It is peace that flows throughout your being as you come into the realisation that you have found what you were searching for. When you land on the safety net of peace, you know your search is over. Any time you feel the pain of separation or the lack of peace, look within and find me within yourself, remembering then who you are. The cycle of lives only exists for you until you choose to release yourself from that guise of separateness and return back to your omniscient self. That is the reason you chose your lifespan—to pass the tasks you set yourself, knowing that you could take one or more lifetimes to do this. After passing the set tasks, you would move up a level, so to speak, and be faced with a new challenge, a new task. Your purpose is to rediscover yourself and reveal yourself in your divinity and alchemy is the Divine gift from God to realize this. This world has earlier unplugged ten of humans 12 DNA strands from this Divine truth. You are the New Jerusalem, the evolved psyche in Oneness with Universal Life. Within the city is the Garden of Eden where the Tree of Life stands. Revelations 21:6 says; the water of life is the knowledge pouring within us from Universal Life itself. It is clear as crystal symbolizes that clarity we receive about life from the Source which is the essence from where all things originate. 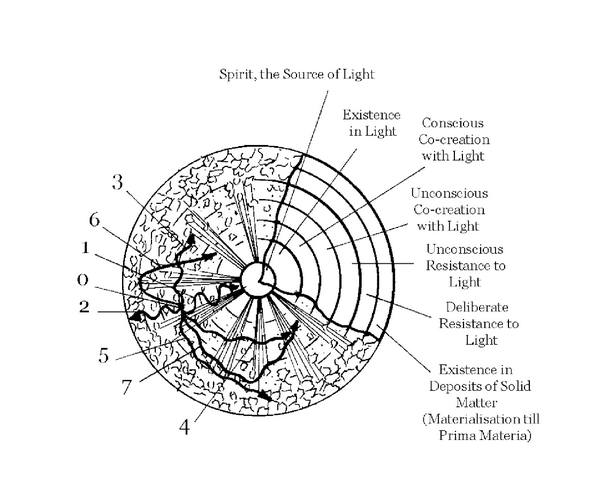 It pours from the pineal which is the Lamb and the Universal Life is the light that fills the body giving us wisdom. Genesis 2:10 says; And a river went out of Eden to water the garden; and from thence it was parted, and became into four heads. The Garden of Eden is the right hemisphere of the brain; it is the 90% we don’t use. The left side of the brain is the 10%. The 10 % on left side is your portion; the 90% on the right is God’s. In order to get to the right, you have to tithe, give the 10% of you mind, not your wallet. In the macrocosm the10% is the material world, 90% is the Quintessence which scientist has named dark matter. Dark matter is the essence that permeates everything. It is life force, Universal Life, in the mythology of Star Wars it is the Force. This is what we tap into in the right hemisphere of the brain. The final, seventh rubric of the Emerald Tablet identifies its author, the revealer of the Emerald Formula, and is known as the Trinity Rubric: Therefore am I called Thrice Greatest Hermes, having all three parts of the wisdom of the Whole Universe. Herein have I completely explained the Operation of the Sun. What makes Hermes thrice greatest? Through his enlightenment, Hennes has conquered all three levels of reality; the Spiritual World of the subtle mind and imagination, the Mental World of our personality and influences of our hidden souls, and the Physical World of gross matter, our human bodies, as well as the Stone, which is the ultimate spiritual embodiment. These levels are represented esoterically as the Sun, Moon, and Earth. In alchemical terms they are higher states of consciousness called Sulfur, Mercury, and Salt. The entity named Hermes Trismegistus has also experienced three incarnations. He first appeared as Thoth, whom the Egyptians worshipped as the God of Thought and who preserved the knowledge of ultimate truth through the great, cleansing Flood, so that the worthy still might have a chance at transformation. Next, he appeared as Akhenaten, the pharaoh who worshipped the Aten, the One Thing, and sought to live in accordance with the providence of the One Mind. Thirdly, he came to us as Balinas, the misfit youth whose rediscovery of the tablet transformed his life, and whose tireless work in Alexandria made it possible for the contents of the miraculous document to be transmitted to our own era. These incarnations of Hermes correspond to the three great cosmic emanations. First was the original act of Thought, the creation of the universe, the grand union of Fire and Water accomplished by the action of the One Mind on the One Thing. Second was the Birth of Light within matter, the rise of spirit and creation of consciousness to accomplish the evolution of soul. Finally came the Virgin Birth from the union of spirit and soul within man, which represents the second creation, man purified and reborn on a higher level. This reunion of spirit and soul is the Christ consciousness that was demonstrated not only in the life of Jesus, but in the life of Balinas and others as well, and which any person can obtain having been shown the way—what Hermes called the Pattern. The all-encompassing Pattern of Hermes is nothing less than the perfection of the cosmic soul. That this process is evolutionary is evidenced by nature herself, just as we can witness its Pattern in our own lives. The alchemical process for achieving the perfection of nature is what is referred to in the last line of the last rubric of the Emerald Tablet. The “Operation of Sun” is a way to describe God in the most objective way: the conversion of energy into matter. The self-sufficient sun, feeding off itself through all eternity, is a symbol of the same process going on within our own souls if we only tap into it. The hidden Sun of our deepest being is also like a nuclear reaction that drives our physical and spiritual transformation. For at the end of the alchemical process, we arrive back where we started from, only now empowered and embodied in an eternal Stone that represents an incorruptible higher consciousness. There is one last message hidden in the Azoth drawing. All the Latin words contained in the outer ring that connects the rays of transformation spell out a summary of what has taken place: Visita: Interiora Terrae Rectificando Invenies Occutum Lapidem. This means “Visit the innermost parts of the earth; by setting things right, you will find the hidden Stone.” The first letter of these seven Latin words spells out the Hermetic word VITRIOL. Vitriol is the first of the arcana, which are secret chemicals in a laboratory experiment that summarizes the entire process of transformation. Acidic Vitriol is the fiery liquid energy that drives physical transmutation and becomes the brain ambrosia or hormone that brings on the materialization of spirit in man. By recognizing and working with the forces of alchemy, anyone can not only tap into hidden sources of creative power but fundamentally transform themselves and their life situations. The Three Principles being enclosed in the vessel, or Athanor, which is man himself, and subjected to a gentle fire—the Incendium Amoris—the process of the Great Work, the mystic transmutation of natural into spiritual man (the living stone), can begin. This work, like the ingredients which compose it, has “three numbers”: and the first matter, in the course of its transmutation, assumes three successive colours: the Black, the White, and the Red. These three colours are clearly analogous to the three traditional stages of the Mystic Way: Purgation, Illumination, Union. The First Magisterium, the Lunar Stone is created. It represents gaining control over the body, so that every fiber and tissue can be completely relaxed. The Second Magisterium, the Solar Stone, is achieved when the mind is controlled through willpower, so that fear and ego do not interfere. The Third Magisterium is the union of the Lunar and Solar Stones with the cosmic presence to create the Stellar Stone or Astral Body. Seen another way, the Conjunction is the union of the Lunar Stone with the Solar Stone, the Marriage of the King and Queen, to create the Lesser Stone in which we become centered and gain control over mind and body. Coagulation, then, is the union of the Lesser Stone with the powers of the Above to create the Greater Stone of the Golden or Astral Body. Having achieved that Greater Stone, you have broken free of genetic, environmental, and even astrological restraints to your being and are free to express the bliss of your true Presence—the Stone. At this stage, you are born into the Universe and have arrived at a new plateau, the Greater Mysteries of the ancients. This is true atonement (at-one-ment) with the mind of God. The Eucharistic Bread signifies the super-substantial sustenance, and the Wine is arch-natural life. It is for this reason that the Alchemical Stone at the red has a higher tingeing and transmuting power than the Stone at the white. The first matters of the alchemical work, to make use of another language of subterfuge, are Sulphur, Mercury and Salt; but these are the elements of the Philosophers and not those of the ordinary kind. In other words, common Sulphur and Mercury correspond to the Bread and Wine before consecration, and the philosophical elements are those which have been transubstantiated by the power of the secret words. That which is produced is called Panis Vivus et Vitalis and Vinum Mirabile . instead of the daily meat and drink by which we ask to be sustained in the Lord’s Prayer. The Salt is that which is called the formula of consecration; it is that which salts and transmutes the natural earth. When Chris( said: “If the Salt lose its savour, wherewith shall it be salted? “this can be understood of the super-excellent and extra-valid consecration; the removal of the Graal signifies that of a certain arch-natural salting, yet the salt of sufficing grace remains, like that of nature, and in its way also it communicates. Christ further said: “You are the salt of the earth”–and this is the true priesthood. The excerpt moves on to instruct the reader in the best method to separate these principles from earth, the prima materia, or “first matter” from which the chymieal opus proceeds. We arc advised to take a portion of fresh earth, “which is sufficiently impregnated with the beams of the Sun and Moone and other stars” (p. 478). and to “divide it into eaquall pans measured” (p. 479). The three principles are then extracted by subjecting the prima niateria to simple processes of “boylcing, filtrating. evaporating, congealing” (p. 479). recipes for each of which are then given. The final outcome of this work is the Philosopher’s Stone itself. Whether it can be accommodated or not to the subject-matter of alchemical symbolism and its literature, we cannot affirm that there is anything remote or unlikely in an attempt to understand the Stone of Philosophy in the sense of that Stone which is Christ : on the contrary, it is the institution of an analogy which is a little of the obvious order, since it is written at large in Scripture. That Blessed Stone which is the desire of the eyes in Alchemy could do no otherwise than recall the ” Living Stone “, the head in chief of the corner, elect and precious, the Spiritual Rock. * And because according to the alchemists the matter of their Stone is common and mean of price, while the Stone itself is Lapis Exillis as Bohme plainly describes it, ” a very dark disesteemed Stone, of a grey colour,” it is inevitable that it should be compared in the mind—whether versed or not in the labyrinth of the Hermetic subject—with that Stone rejected of the builders, which is a Stone of stumbling and a Rock of offence.’ But as Christ is also the Stone of Salvation,’ so is the Philosophical Stone that in which ” lieth the highest tincture “. If the Stone of Alchemy is Christ, it is to be understood spiritually. The Stone of which there is no end to the virtue and glory. He who hath it and knoweth it, if he seek, he may find all things whatsoever [which] are in heaven and in earth. It is the Stone which is rejected of the builders and is the Chief Corner Stone. Upon whatsoever it falleth it grindeth it to powder and kindleth a fire therein. All universities seek it but find it not by their seeking sometimes it is found by one that seeketh it rightly. But others [that seek it in self and for their own gain] despise it and cast it away ; and so it remaineth hidden. Psalm 105:41 says; He opened the rock, and water gushed out; it flowed like a river in the desert. For they drank from the spiritual Rock that followed them, and the Rock was Christ.